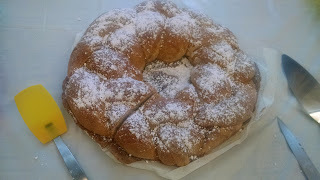 As promised, the picture of my braided coffee cake all sugared up. It was soon all gobbled up! We had an unexpectedly big crowd today for our coffee hour. I expected a small crowd what with the Super Bowl which, you can tell by that I am writing at the hour I am that it does not mean the world to me. I would rather be listening to Leonard Pennario or finishing up a sketch, both of which I have managed to work into my evening so far. But back to our coffee hour. Maybe it was the mild weather, a break after all these frigid days. Maybe it was that word has gotten out about my rocking pastries. We will never know. 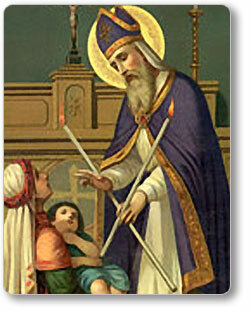 But after the Blessings of Throats, it being the Feast of St. Blaise, everyone came streaming over. New people, regulars, everyone. I was astonished! A word before I continue about the Blessing of the Throat. There was no way I was going to miss getting my throat blessed, particularly since I somehow skipped my flu shot this year. But I had a quandary. Oh no! I forgot to put out the sugar! The sugar is supposed to go next to the coffee. The coffee pot had been gurgling and percolating and the cream was out and also on hand was a beautiful bottle of Frangelico that one amazing young gentleman had brought to go in our coffee. But the sugar. The sugar! I had to get over to the coffee hour to put out the sugar and so I did the unthinkable. I cut in line for the Blessing of the Throat! Everyone was lined up in two queues in the center aisle. But the lines went on forever. Surely it would not matter if I slipped in, you know? So I did. ... this one woman in line looked at me dagger-eyed! She does not go to coffee hour and so she does not know my vast responsibilities to it. And so she judged me. That is what Lou told me anyway. He said he saw the woman make this face. It is a big problem, someone cutting in line for the Blessing of the Throat! But so must it be. I made it over to coffee and I got the sugar and put it out. And there were already one lady and two gentlemen waiting for it, would not you know. The good news is, we carried off this feast, which besides what I brought also included bagels and cream cheese brought by our friend Thomas and beer bread that our friend Joe made with blueberry ale. Joe if you will remember is the gardener with the romantic flowering quince. I have his recipe for the beer bread now and we have not heard the last of it. Next week I will remember the sugar. I will not make that mistake again. I will branch out into different mistakes.